Nicole Stamp is a director based in Toronto. This website is her resume. Nicole started out as an actor and improviser before moving into directing, then branching out into writing and producing. This breadth of experience influences her directing work, which is fast-paced, richly detailed, and funny. Nicole has a strong sense of storytelling and is known for getting exceptional performances out of her actors, filled with detail, humour, and emotional truth. She is experienced directing adults, teens, and kids, and her ability to empathize and communicate allows her to fluently direct both actors and non-actors. Nicole is very savvy on social media (she is active on Facebook, Twitter, and Instagram), and she is personally able to relate to about 1000000 demographics. She has extensive experience making content for adults, teens, kids, lgbtq people, ethnically diverse audiences, political audiences, scientists, artists, and average Joes- basically every possible slice of the human pie. Nicole is fast, friendly, funny, and fun. You can find her at stampworks (at) gmail (dot) com. STUDIO, FIELD, & VOICE DIRECTOR: Nicole has directed over 30 promo videos and commercials for companies including MAZDA, Alliance Films, Gallo Wines, the Ontario Elections Campaign. Directed several award-winning short films. Very comfortable in unpredictable environments; able to come up with great content on location and with very few resources. Able to help inexperienced talent shine. CONTROL ROOM DIRECTOR: Nicole’s been a Multi-Camera Director for over 700 hours of live broadcast & live webcast shows, including the pre-season celebrity draft show for The Bachelor Canada, 6 episodes of the digital aftershow for Netflix drama Between; Inside Between for CityTV, The SPACE for TVOntario, and the popular talkshow Your Voice for TVOntario. AWARDS: TVOKids won 2 Gemini Awards, among 6 nominations, for shows on which Nicole played a key creative role. Nicole holds two other awards of note: A Toronto Arts Award for Excellence and Innovation in Theatre, and a Guinness World Record for playing dodgeball for 36 hours without sleeping. 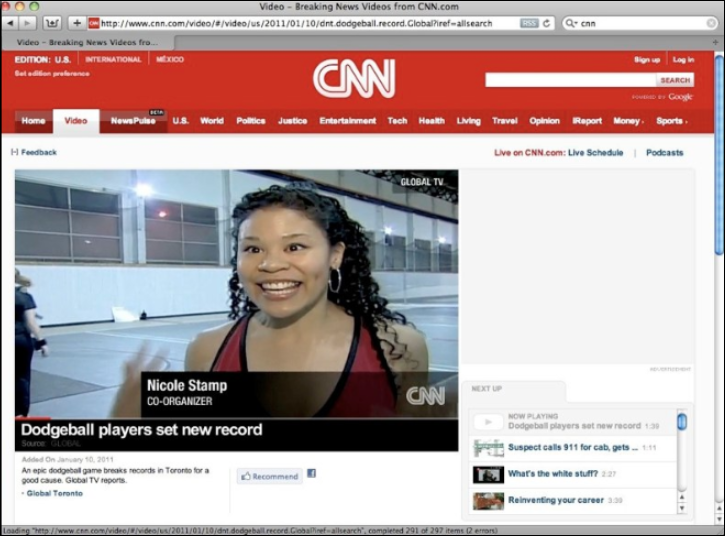 WEB CONTENT SPECIALIST: Nicole hosted Time Trackers, a TVO series that won the very first Gemini Award for Best Interactive Content. She also worked on Carmilla, a webseries with 70 million YouTube views, winner of a Canadian Screen Award for Best Digital and shortlisted for a Cannes Lion. Nicole has co-created successful web content for brands including Alliance Films, CityTV, Gallo Wines, Toys’R’Us, Sport Chek, Corus, and TVOntario. ACTING: Trained in Meisner Technique, Method, classical theatre, and comedy. 10+ years as a TV and film actor, including roles on The Handmaid’s Tale, Orphan Black, The Expanse, Dan For Mayor, Covert Affairs, Remedy, Living In Your Car, The Next Step, Degrassi, and the wildly popular Shaftesbury webseries Carmilla (over 70 million views!) (IMDb) Nicole is also an experienced acting teacher including guest faculty at University of Toronto and Sheridan College. COMEDY: 2 years improvising with the Second City Canadian National Touring Company. Also wrote, directed, and performed a solo comedy show that toured in Toronto, Montreal, Pittsburgh, and England. ADVERTISING: 1 year as Senior Producer at a boutique advertising agency; 1 year as a Producer-Director at a boutique video production firm. Created viral video, print, and web campaigns for clients including Disney Consumer Products Canada, Alliance Films, eOne Entertainment, Gallo Wines, and several Ontario Elections Campaigns. Skills: strategizing, copy, user experience, media buys, exceptional and diverse casting, live activations, audience engagement. THEATRE: Actor in 50+ critically-acclaimed plays and director of 40+ new Canadian plays. Press clipping from theatre career. VOICE: Series Lead roles on Total Drama: Ridonulous Race, Razzberry Jazzberry Jam, and 3 series which won Gemini Awards: Tumble Town Tales, Word Wizard, and Time Trackers. Other credits include Disney, Jim Henson Company, and Ubisoft. Studied voice acting with numerous prominent teachers. VIDEO GAMES: Full performance capture supporting role in a major upcoming title. Voice roles in Watch Dogs 2, Far Cry Primal, and three more upcoming titles. MUSIC: Professional singer, proficient on flute & recorder, and a solid grounding in musical arrangements- meaning that video and audio editing is fluid, rhythmically-influenced, and syncs beautifully to the backing track. WRITER: Nicole’s essay, What decent men can do in response to #MeToo, went viral on Facebook- over 70,000 shares and 8,000 comments in one week. CNN then reached out and commissioned it as an op-ed piece. CNN positioned it both on the front page sidebar of CNN.com, and in the top spot on the CNN Opinions page for several days. SCREENWRITER / PLAYWRIGHT: Numerous promo videos for Alliance Films, Inside Between for CityTV. Several kids TV shows (including TVOKids’ EnviroGirl, and Cookie Jar’s Noonbory). In-depth screenplay analysis and coverage for the Harold Greenberg Fund. Invited member of Tarragon and Passe Muraille Playwrights’ Units. Writer of two critically-acclaimed plays. MENTORSHIP: 10+ years of dedicated Youth Mentorship, including: Director, Board of Directors, The AMY Project, 9 years as an AMY Project Artist Mentor. Also: Through Our Eyes Film Projects, CityLights Film Project, Crossing Gibraltar, Future Possibilities Canada, teaching improv in a high-security men’s prison (funny story, ask me some time!). EDUCATION: University of Toronto (Bachelors Degree in Theatre and English Lit), Sheridan College (Acting Graduate with High Honours), George Brown College (Screenwriting Certificate), Second City (Improv Scholarship), Meisner Technique, Physical Theatre, and many, many acting classes. TEACHING: University of Toronto, Sheridan College, Banff Centre, Robert Morris University in Pittsburgh, Armstrong Acting Studios, Toronto District School Board, Full Sutton Prison in England, many more. AFFILIATIONS: Canadian Media Guild, ACTRA, Writers Guild of Canada. INTERESTS: Comedy, science (especially medicine & evolutionary biology), pop culture, film, books, journalism, singing & composition, design, furniture refinishing, food, early childhood education, diversity, medicine, Web 2.0, environmentalism, social justice, brunch, viral marketing, competitive dodgeball (Guinness World Record Holder). Nicole Stamp lives in Toronto, loves to work, and is always willing to travel. She can be reached at stampworks (at) gmail (dot) com.